There's no better way to spend a Sunday night than dancing at the beautiful Laurel Park. In the tradition set, we bring you a live music night every holiday weekend. Please join SalsaNow on Sundays at the nicest venue in town to dance the night away and party with the friendliest people in MD. Doors open at 7 pm for Happy Social Half Hour. Salsa lessons with Niss Albaig start at 7:30 pm for beginner level, and at 8:15 pm for a partnering pattern. DJ plays 9 pm to closing. Admission: $10 Cash only please. Cover includes lessons and dancing. Free parking and safe, convenient location. LAUREL RACE TRACK, 198 Laurel Race Track Rd, Laurel, MD 20724, 3rd level TD Terrace Dining, far right side of building. Full Bar. Wood flooring, air conditioned with lots of seats for resting. Join SalsaNow at Game for the best Latin dance party night in Baltimore. Salsa/Mambo, Bachata, Cha cha, and Merengue. A lot of good times and dances here, lots of friends, and every Friday night is better than the previous. The energy is high, the crowd keeps growing, many dancers are coming, and so much more fun still to be had at this nightclub. Please join us for best music and fun dancing. Dance to your heart's content. If you have dance game, then this is where you need to be. Come out to play with us at Game! Salsa lessons with Niss of SalsaNow start at 8:30 pm for beginners and 9:15 pm for intermediate partnering patterns. DJ Mambo Soul will get your body moving and grooving to the best tunes for your dancing and listening pleasure. DJ and dancing starts at 10 pm until closing. $10 Cover includes admission, lessons and dancing. Conveniently located just off I-95, next to the Horseshoe Casino. Free parking lots on both sides of the building. SalsaNow offers Salsa group lessons every Tuesday at the IFTC Studio, 10221 South Dolfield Road, Owings Mills, MD 21117. Join Niss Albaig for lessons that will have you on the dance floor in no-time. No partner necessary and walk-ins are always welcome. Cost $10 each lesson. Click here for more information about lessons currently available, and check back for more options on learning to dance. We will have all your Latin dance needs covered. Group salsa and bachata classes held on indicated Mondays. No partner necessary and walk-ins are always welcome. Bachata class 7:30 pm with Linda Saenz of Classé Dance Co.
Sunday Salsa Bachata Latin Night at the beautiful Laurel Park, brought to you weekly by SalsaNow. A classy evening in Maryland to dance and party in celebration and joy, where we can reunite and unite in what we love: music, dance, and PEOPLE. Join us for great music and dancing in a super friendly and non judgemental atmosphere with the only purpose of having fun. Salsa, bachata, y mas! Vamonos! Doors open at 7 pm. Lessons start at 7:30 pm for Beginner level, and at 8:15 pm for Intermediate level. Dancing starts at 9 pm and goes to closing time. Featuring multi-level dance lessons of various styles and genres, guest instructors, specialty lessons, performances, live music and great DJs, theme nights. Two rooms for dancing. Expansive dance space with wood floors. Free parking and lots of it. Convenient safe location. Full bar and food available on premises. Oh, and nice clean bathrooms! SalsaNow brings you THE hotspot for salsa and bachata dancing in the city. We are back with Salsa Fridays at Game! The highly anticipated Baltimore's newest salsa bachata latin dance night hosted by SalsaNow. Game is conveniently located just off I-95. It has a large dance space, full food menu and drink specials. Come out and enjoy an evening at this great club. Calling all Baltimore Salseros, Bachateros, and Latin music lovers. This one is for you. The new Friday Salsa night at Game. We were picky and worked hard to bring you a quality, stylish, safe and convenient place for your dancing pleasure. Now it's up to you to show that you really want it. Lessons with SalsaNow, and always the best DJs. Delicious menu and drinks all night. Free attached parking and just $10 cover for the night. Lets make this the place to look forward to for starting your weekends! Every Friday. $10 Cover. Lessons included. Free attached parking. Summer is coming, so is vacation time. Make it the best time ever with your friends at the Salsa Bachata All-Inclusive Dance Vacation in Mexico. The SalsaNow Performance Team is comprised of students from our Salsa classes. Team practices and performances provide an opportunity for students to take their dancing to a higher level and to strengthen the camaraderie among students. Performances also provide a platform for SalsaNow to showcase material that is taught in class and to demonstrate how much fun it is to be a part of SalsaNow. We are very proud of all of our students. The student performance team is relatively informal, with dancers from all walks of life, of varied ages and experiences. The teams have trained for a professionally choreographed routine under the direction of SalsaNow's Niss and Alex. Practices are held weekly at the Admiral Fitt studio on Tuesdays at 9 PM. The team performs at various events and club demonstrations during the year as opportunities arise and schedules allow. We welcome new members to join the next team. Qualified dancers should have a full grasp of salsa basics at an intermediate level, the ability to commit time to rehearsals, and most importantly, enthusiasm! Team experience is an excellent way to improve your dancing and meet lots of equally keen dancers. The choreography is designed specifically for this team with the abilities of the team members in mind, and no matter your prior experience, you will have a lot of fun as part of a close knit group, not to mention the thrill of entertaining the crowds. There is a fee collected up front for one month at a time based on how many hours are spent on training, and the dancers will need to purchase their own costumes (minimal cost). New dance team training will start soon and continue every Tuesday night. For more information about the salsa team or to join our team, please contact us. SalsaNow is turning 10 and we invite you to join us in celebrating. Last year almost 400 in attendance. Check out the lineup this year and plan to join us for this BIG one. Linda Saenz, Classé Dance Co.
Blanca Flores, Con Sabor Dance Co.
Edwin Alvarez, Zafire Dance Co. The Monday Latin night has a brand new home on Mondays in the heart of the city. Please join us for a night of lessons and dancing at The Rockwell. Located in Fells Point, The Rockwell is a modern tavern featuring a lively strikingly bold design, with a state of the art sound and light system, and a nice smooth wood dance floor perfect for dancing. 8 pm Salsa/Bachata lessons with Niss of SalsaNow. 9 pm to midnight Music and dancing. Complimentary admission. Mr. Mambo's & SalsaNow Partner Up AGAIN to Bring you a Fabulous Themed Latin Dance Party at the Beautiful Laurel Race Track Facility! ✮ Costume Contest - Prizes to Upcoming Area Events! 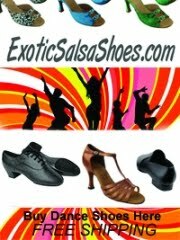 ✮ (5) Salsa, Bachata, Zouk Workshops w/The BEST AREA Instructors! ✮TWO Ballrooms - Salsa/Mambo & Bachata/Zouk/Kizomba. ✮Fully stocked bar for all your beverages. Cash or credit accepted. WHERE: LAUREL RACE TRACK, Laurel, MD 20724, 3rd level Dining Terrace (far right side of building). Wood flooring, air conditioned with lots of seats for resting, fully stocked bar, free parking. Please join in celebrating SalsaNow's 9th Anniversary. A great event lineup of lessons, music, dancing, and a show. SalsaNow will take you there. SalsaNow was formed out of love for the Latin music and dance and a passion for sharing the experience and joy of dancing with others. Niss and Alexandra are very active in the Baltimore Salsa community as instructors, promoters, organizers, and ambassadors of dance. They are committed to supporting and growing the dance community through professional instruction, fellowship and camaraderie, and hope to see you at one of their classes, events or out on the town. Imagine yourself in paradise, then add salsa and bachata, music and dancing, beaches and exotic experiences, friends and family, learning and sharing. All at an affordable all-inclusive getaway with SalsaNow, and call it heaven. Whether you love lazy days at the white sandy beach under a palm tree or adventurous excursions, spending the afternoon with fun activities or just enjoying the cool libations in the sun by the pool, relaxing romantic nights or the excitement of dancing until sunrise, there's something you will love about vacationing in our favorite resort. MAKES A PERFECT GIFT. GIVE THE GIFT OF DANCE - A GIFT OF HAPPINESS THAT KEEPS ON GIVING. CAN BE ISSUED ALMOST IMMEDIATELY FOR ANY AMOUNT. PLEASE CONTACT US BY EMAIL OR PHONE TO PURCHASE. Check out SalsaNow on Facebook for current notices and updates. Please take a moment to like us and share it with your friends. Join our SalsaNow group to receive notices of events, classes, venues, and special discounts. Like the SalsaNow page on Facebook with one click. Baltimore Dancers Care is the charitable arm of the SalsaNow Dance Company. Our charitable efforts are realized through our experience in event coordination, dance instruction, demonstrations and performances. Salsa for Haiti was a tremendous success, raising over $2,500 for the Haiti Emergency Relief Fund. This charity event was sponsored and organized by Baltimore Dancers Care, the charitable arm of the SalsaNow Dance Company. Special thanks go to performers Figgy, Linda, Antonia, Greg and Lemery who brought the house down with their talents. The first ever Hustle Flash Mob debuted in Washington, DC on April 9th, 2011 during the annual Cherry Blossom Festival. Televised locally and made national news, the mob was a success in every way. Flash Mob director Erica Smith teamed up with Joyce Szili to co-choreograph the Official Hustle Flash Mob danced to Lady Gaga's popular hit song, “Just Dance”. Niss and Alex Albaig taught the hustle choreography in Baltimore and had a great turnout of hustlers joining the DC mobsters for the flash mob. For more information about how you can participate in future Hustle Flash Mobs, please contact us and visit the DC Hustle Flash Mob Facebook page. You can also watch a breakdown of the choreography on YouTube. Many Thanks to Erica Smith and all who participated in DC's First Ever Hustle Flash Mob! Great Job!